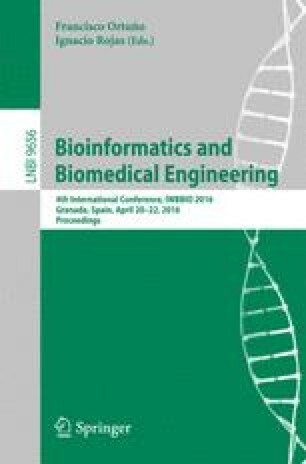 High-dimensional multi-objective optimization will open promising approaches to many applications on bioinformatics once efficient parallel procedures are available. These procedures have to take advantage of the present heterogeneous architectures comprising multicore CPUs and GPUs. In this paper, we describe and analyze several OpenCL implementations for an application comprising multiobjective feature selection for clustering in an EEG classification task on high-dimensional patterns. These implementation alternatives correspond to different uses of multicore CPU and GPU platforms to process irregular data codes. Depending on the dataset used, we have reached speedups of up to 14.9 and 17.2 with up to 24 threads for the implemented OpenCL CPU kernels and of up to 7.1 and 9.1 with up to 13 SMX processors and 256 local work-items for our OpenCL GPU kernels. Nevertheless, to provide this level of performance, careful considerations about the use of the memory hierarchy of the heterogeneous architecture and different strategies to cope with the irregularity of our target application have to be taken into account. This work has been funded by projects TIN2012-32039 and TIN2015-67020-P (Spanish “Ministerio de Econ. y Compet.” and FEDER funds).